A guest manual for people aged over 60 who are participating in the Alpha Course. The manual has been written in a reader-friendly manner with suitable spaces for notes about the 15 talks. The Alpha Course manual has been re-published in larger font that follows the requirements set out by the Royal National Institute of the Blind. Senior Alpha Courses have been running successfully in residential homes and purposeful meeting places for the elderly. 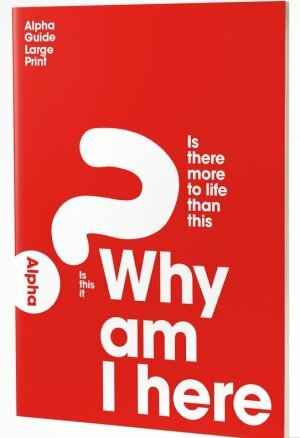 This is a very valuable manual that will be ideal for any participants of a Senior Alpha Course. Alpha: Guest Manual Large Print by Alpha International was published by Alpha in February 2005 and is our 4494th best seller. The ISBN for Alpha: Guest Manual Large Print is 9781909309883. Be the first to review Alpha: Guest Manual Large Print! Got a question? No problem! Just click here to ask us about Alpha: Guest Manual Large Print.